I'm sure you've heard the term "paperless organziation" - the idea is to stop printing everything from articles to receipts, and instead develop a system that makes them available to you electronically. My husband is working toward going paperless for the things he does for our home, and I know he would love it if I could do the same. It has always seemed a little overwhelming to me, though, so I haven't done much before now to that end. I am constantly printing things that I'd like to read later, but what usually happens is I get piles of paper that are messy and disorganized - not to mention unread. Have you ever made a home management binder? I have. I still have it, in fact - it moved with me from our previous house, over three years ago. It was a lot of fun to print all that stuff and put it in a notebook. It's so pretty! I have not looked at it much, except sometimes when I'm cleaning my room when I run across it and think, "Oh, yeah, I did have this, didn't I?" I haven't updated the information in it and it just needs to be taken apart and recycled at this point. Mystie Winckler, the author of Paperless Organization, is a busy homeschool mom of three who works hard to maintain an orderly and harmonious home. She found, after her third child was born, that she needed to simplify things like grocery shopping and meal planning. She had a home management binder, but found it too bulky and time-consuming. As a fellow homeschooler, she knows what our days look like, and how little time we have to spare. She developed these ebooks from her own efforts to keep her home running smoothly. She blogs at her Simplified Pantry site, as well as at Simply Convivial, about how she implements what she's written in her ebooks. 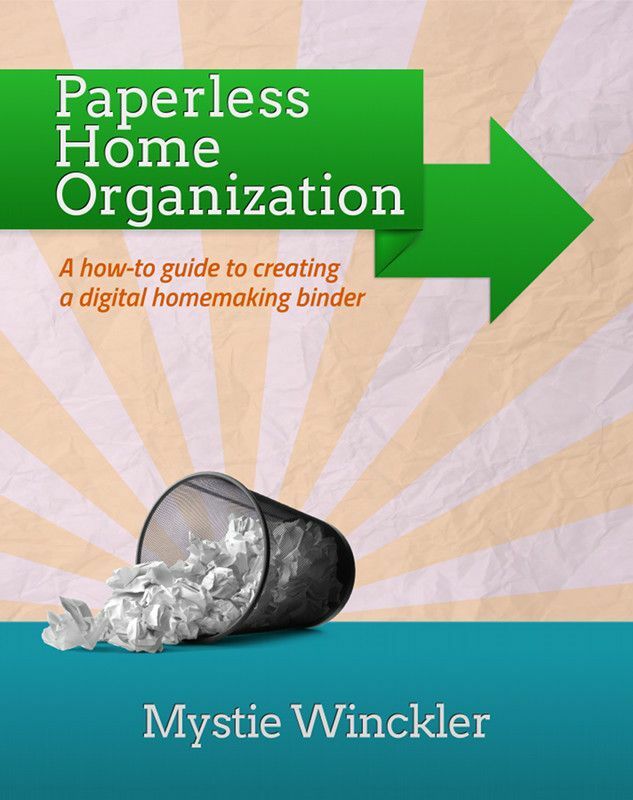 Mystie's book on paperless organization describes her electronic version of a home management binder. She explains what organization is, and what it isn't - along with the wisdom that one cannot truly "get ahead" with organization, one can merely keep up with it, like treading water. I think that's been part of my mental block about organization: I can't make it instantly perfect, and it's going to take consistent effort to keep on top of it. She recommends using some free, online tools and their corresponding apps for wireless devices. She also explains exactly how to use them, which is SO helpful. She gives examples of setting up your calendar, to-do lists, daily schedules for home and homeschool, and so much more. Her system is based on the principles in the book, Getting Things Done by David Allen. I haven't read it, but I plan to do so. The first thing I did was create accounts in the three programs she recommends, if I didn't already have one: Evernote, Remember the Milk and Google (mail and calendar). Evernote is free, but in order to access your notes without internet access, you have to upgrade to a premium account ($45 for 1 year). 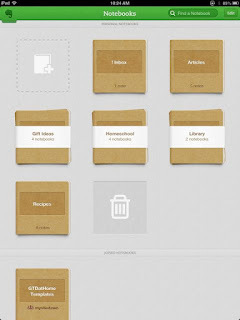 Another option is to use Simplenote for your shopping lists. I opted to sign up for Simplenote, for now. Once my accounts were set up, I started working through her instructions. Setting up mail filters and Remember the Milk were both pretty simple. I have tweaked the system a bit - I use Apple Mail, because I have more than one email account, and all my email collects there. I did learn how to apply filters in Apple Mail, which is something Mystie recommends, to file away email I need to keep but don't necessarily need to see, like order receipts. Also, shortly before I received this ebook, I started using Cozi as my calendar, and I like it, so I'm going to continue with it. Evernote takes quite a bit more time. I had signed up for an account previously, but had no idea how to use it. Mystie's book has made that so much simpler! She showed me how to use features of this program I didn't even know were there - like stacks. She explained how Evernote works like an electronic notebook, and it makes ever so much more sense now. She walks through using Evernote as a filing cabinet, a home management system, a homeschool system, and a blogging system. I'm still working on getting all my stuff set up, but I really like her method. She has created some templates for things like To Do lists, which you can access and use as they are, or tweak to suit yourself. Like any new system, implementing it and keeping it up takes time. It's worth it, though, to have less paper making a mess in my house, and to have everything available at my fingertips in one place. This is a great system, and it's certainly making my life easier, even with the learning curve to get it up and running. All three of Mystie's ebooks are available at her website, Simplified Pantry. You can choose PDF or Kindle format for your files. Paperless Organization is $3.99, and each of the cookbooks is $12.99. Mystie is offering a special right now: 30% off when you enter TOS2013 at checkout! The discount will work on any or all of my eBooks, from May 20 through June 3rd. This makes it a GREAT time to try her books. You won't be sorry!